If you have cracked, chipped, broken or even missing teeth, Dr. Steve Aspros, Dr. Ransey Boyd, and Dr. Kirstin Walther may choose to repair them using traditional crowns and bridges. This brings on a multitude of questions: “What is the difference between a crown and a bridge?” “Which one is right for me?” An easy way to think of it is that a crown is used to restore a single tooth, while a bridge is intended to replace a row of missing teeth. A crown, sometimes referred to as a “cap,” slips on top of a damaged tooth to restore its lost structure. It can be made of metal, porcelain fused to metal or pure porcelain. The specific material we recommend for you will depend on which teeth are being repaired. For example, with the front teeth, we would always suggest all-porcelain crowns because they are as durable and strong as metal crowns and can be color matched to blend with the rest of your smile. It only takes a few short appointments to get a crown. When you come into our office, Dr. Aspros, Dr. Boyd, Aspros, or Dr. Walther will begin by shaping your tooth so that the crown will fit it snugly and securely. 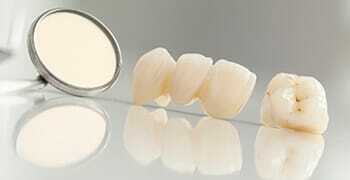 They will then take an impression of it and send that impression to a dental lab to design and fabricate your crown. During this process, you will have a temporary crown placed. When you return to our office, one of our doctors will place the final crown into your mouth with a small amount of dental cement. After that, your new tooth is ready to go. A dental bridge can help give you your missing teeth back. It works by attaching a prosthetic (or “pontic”) tooth to adjacent crowns so that it literally “bridges” the gap between them. The health of these adjoining teeth is very important, and if they are not strong enough to support crowns, your doctor may choose to anchor your bridge using dental implants. Regardless, once these teeth have been prepared to fit the crowns, our team will take an impression of your teeth and send it to a local dental lab to make your bridge. About a week later, you’ll return to have it placed. Bridges can be removable or fixed, and you’ll be able to discuss both options with your doctor during your appointment. Both crowns and bridges can last for many years with the right maintenance: routine brushing, flossing, and regular checkups with Aspros, Boyd & Walther Dental Associates. With either one, you will get a complete smile that looks great and functions comfortably again. If you have any questions about crowns or bridges, or are ready to make your smile whole again, contact our office today for an appointment.